Nothing makes our hearts happy quite like a fabulous accessory. That perfect pair of heels, a stunning shade of polish and, of course, anything + everything from Jennifer Behr, a designer that always brings the pretty with a collection of handmade headpieces that set the standard in the fashion + bridal worlds. Adding a little bling to your wedding day look? It’s never been so beautiful. 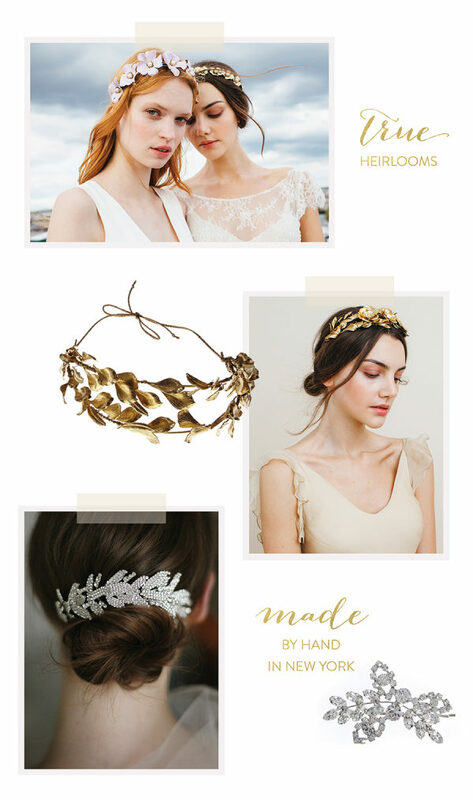 Known for her intricately crafted headpieces that are elegant, timeless and handcrafted in New York, Jennifer Behr’s enduring designs are exactly what you’ve always dreamt of. From her breathtakingly beautiful combs to the insanely gorgeous tiaras to the stunning handmade crystal circlets – heirloom-quality floral crowns will take your breath away in an instant. It’s a dedication to quality that shines through each and every piece… some that can take literal hours to create. Perfect as a complement to a veil or as its own centerpiece, it’s no wonder celebrities and brides around the world are obsessed. It’s an easy thing to be. Jennifer Behr is offering a 20% discount until March 15, 2016 for Style Me Pretty readers! Simply use code SMPbride at checkout!